Don't you love a good chalkboard? 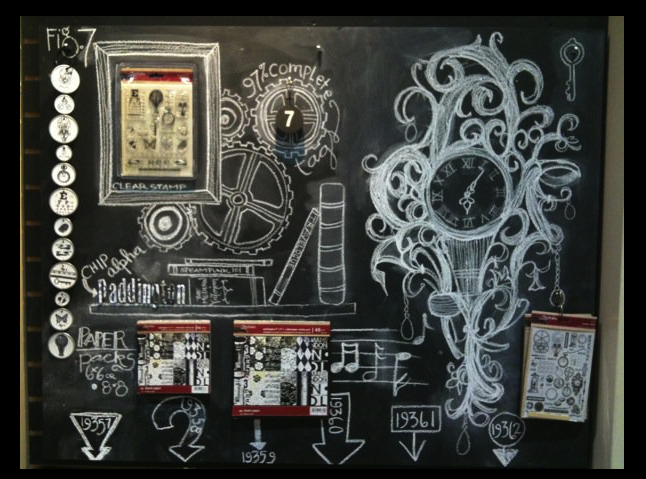 A blackboard can be so striking...and the nature of chalk is fabulously forgiving...and allows for constant change! 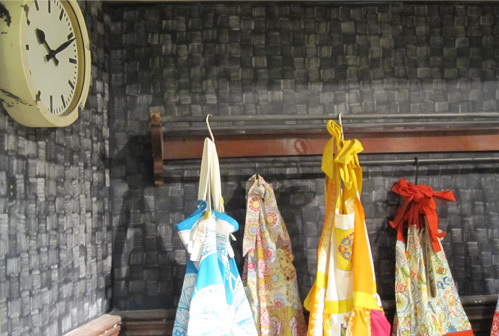 This beauty hangs behind the counter at Frances, one of our favorite stores in Phoenix. Vintage chalkboards are great, but with all the good chalkboard paint products out there you can even make your own. You don't have to be traditional, it can be on a multitude of surfaces. Here's some inspiration to get you started. 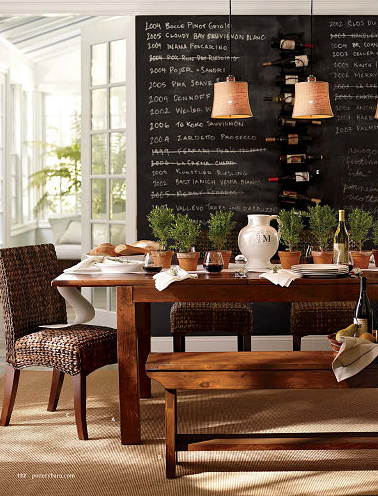 I think every dining room needs a chalkboard. Love how it is paired with beautiful wainscoting. This picture first appeared in Better Homes and Gardens way back in April of 2003. 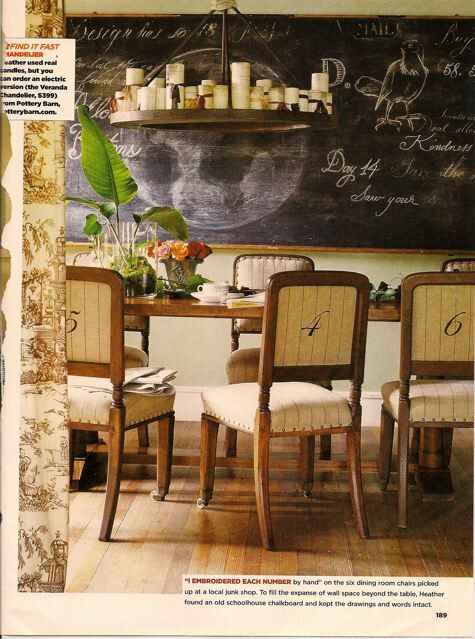 I had saved it to remember the numbers on the chairs, but bonus, it also had a cool chalkboard that the home owner and style editor for Cottage Living magazine, Heather Chadduck found in an antique store and then left the drawings intact! Funny thing is... Paula and I did not really meet till 2005 and she had this same picture on her bulletin board (I think she still does). 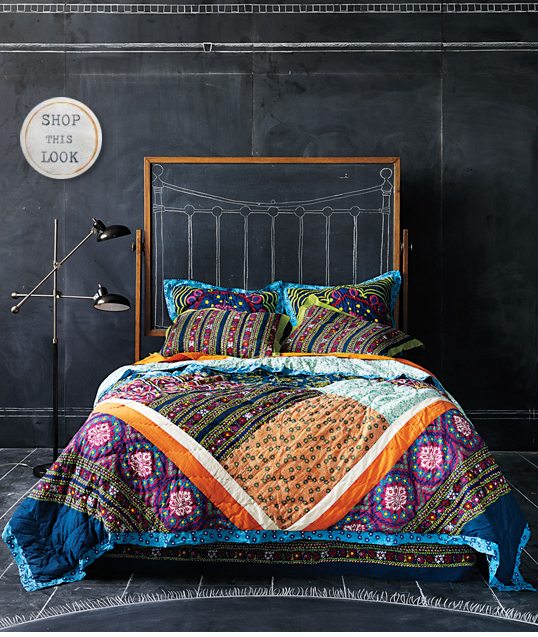 Note: If you are a true design junkie like we are, you might recognize Heather's chalkboard that was first photographed in her former house in Alabama. The article appeared in Cottage Style magazine was also a stand out since her style "speaks" our language. 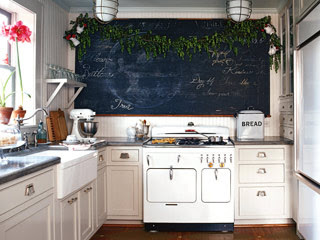 I mean who would have thought to put a chalkboard that big in the kitchen? It looks FABULOUS there too! Heather is now style director for Coastal Living magazine. Make a door into a chalkboard. Love Paula's kitchen chalkboard that her husband made to disguise the door leading to the garage. It serves double duty giving her not only a place to write a phone messages, since it's right next to the phone, but also a place to make her grocery list. 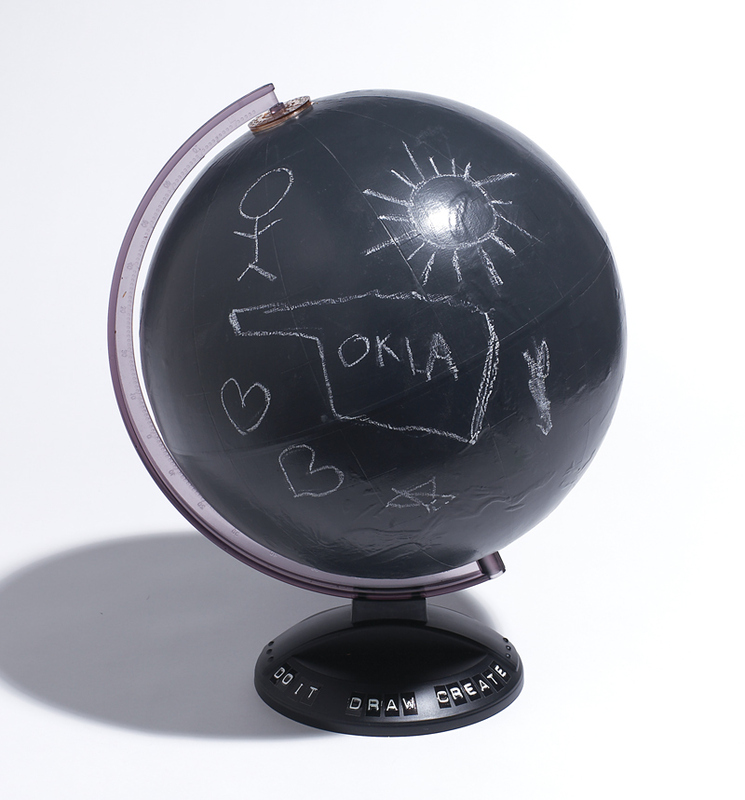 Paula just recently bought this to decorate her cool kitchen chalkboard. We love all Shanna's images...so many uses from home to wedding to office. Love her work! Oh, and she has a fabulous blog you might like to peruse. 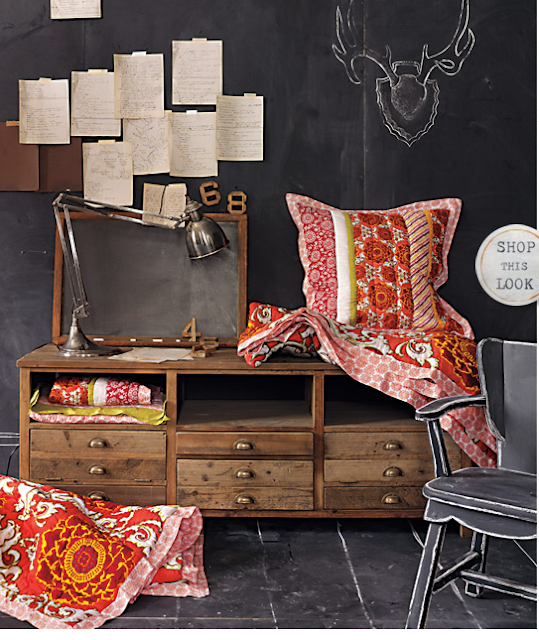 So clever, creating an all over pattern with chalk dust. This was all about the Paddington collection. 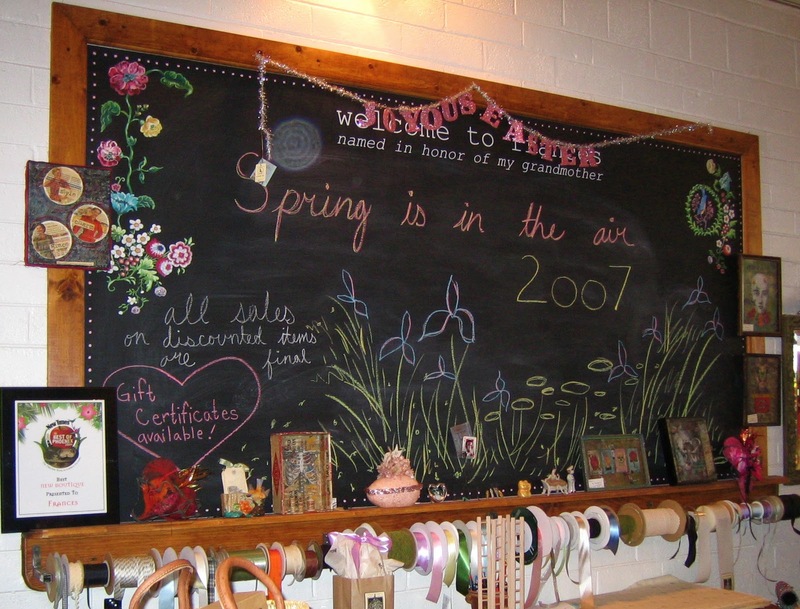 We painted some thin board with chalkboard paint, and put it over one of our regular sections of slatwall. We gave Janelle a box of chalk and let her have at it. Didn't she do a great job!! 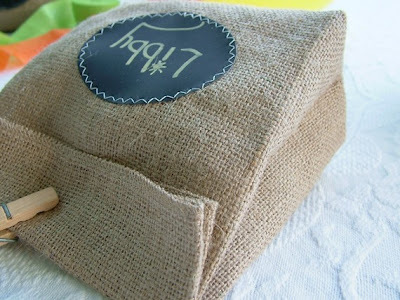 Love the idea of creating your own chalkboard label and sewing it on a bag. Round chalkboard tag....make your own or these are at Found. 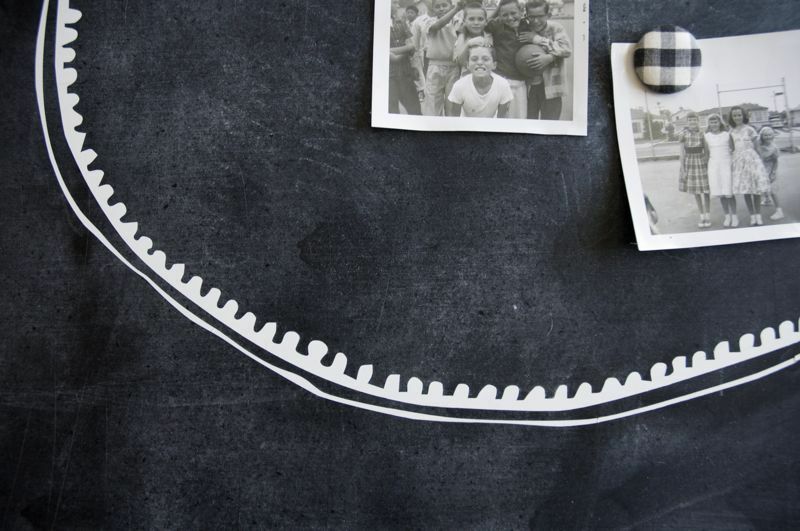 If you are interested in a HOW-TO for making a basic chalk board for your house, click here. 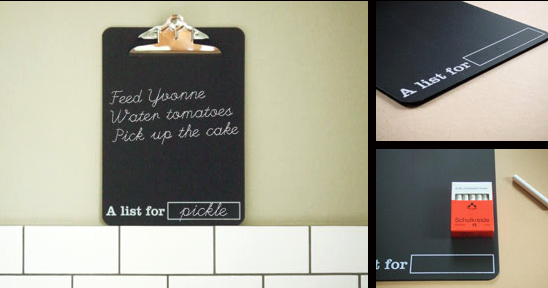 Did you know you can make your own CUSTOM COLOR chalkboard paint by adding unsanded tile grout to the color of your own choice? Read about it here. So many options, the possibilities are endless...happy creating! Very cool! I made my own chalkboard for my house - love it and it was easy! There's some great inspiration to do more here! Thank you! Wonderful inspiration for using chalkboards. I never realized that was the same chalkboard in both Heather Chadduck pictures till today. Both rooms...I've admired for a long time. Oh...how I miss Cottage Living. Great post. Good ideas!!! You should have included one of Alli's chalkboards....they're darling!! 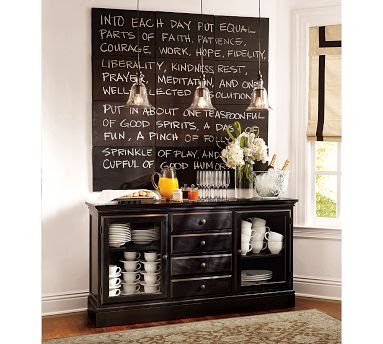 I have always loved that Pottery Barn chalkboard with the beautiful saying! I'm dying to steal Paula's idea of the chalkboard on the door in her kitchen - so cool! And since my sweetie is a carpenter, I'm positive he can pull that one off without a problem. Thanks for some great inspiration and ideas! 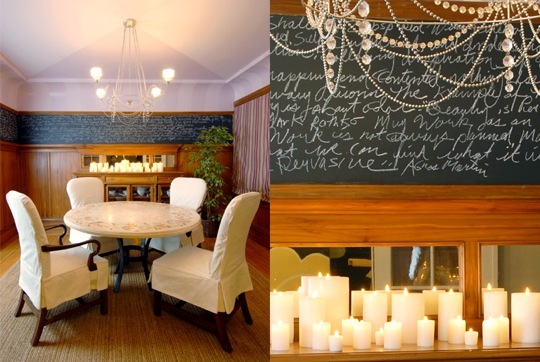 I've loved Heather's dining room since it first came out. The picture of her dining room and the rest of her cute house is in my favorites file. Great other photos too. Thanks. I'm going to check out Heather's work in Coastal Living, to see if there's a sign of her. I love her style. 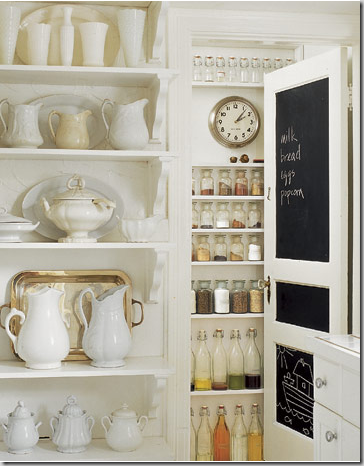 I have an old door i am going to use for my pantry ready to put up that I plan on making a chalkboard in each of the 3 inset panels. It should be so cute. I loved the inspiration pics you included in the post. Also remembering how much we ooh'd and ahh'd at the large chalkboard at Frances a few years back. Thank you so much for the link-up! I am flattered to be included in such amazing projects!